There are infinite ways to look at life as you live it. However, it usually ends up falling into one of four categories. 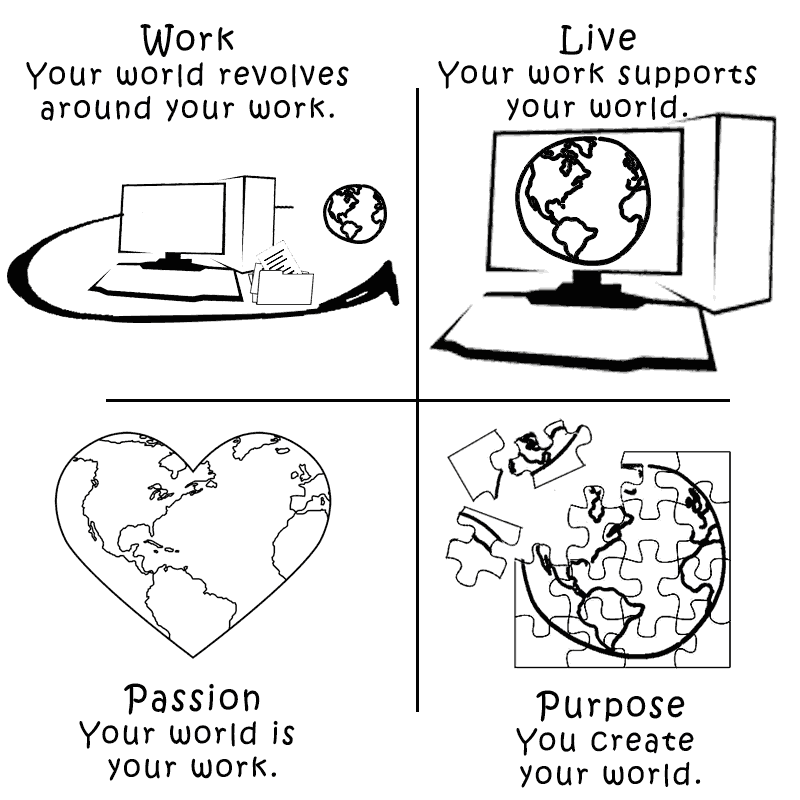 You live to work, work to live, follow your passion, or find your life’s purpose. Although, what do they all mean; How do you simply ‘find your passion’? When do you know that you’re simply living to work? What is your purpose? Do you even have one? Which one of these makes you successful? Is there even a correct answer? These questions get tossed around with little thought behind them and people often leave a lot more confused than before they asked. To broadly look at your life and understand where you are can give you a sense of great power and control. This will allow you to choose if you wish to continue with your journey or make a pivotal change. Below we’ve explained each one with an example to help understand that situation. Remember we said there are numerous ways to see your life? Well, truthfully, placing them in just one of these four is very limiting. However, you could be in more than one, you could be heavily defined by one and have a sprinkle of another or spread evenly across two. You might even find you dabble a little bit in three. I’m sure you all know at least one person like this – a person who lives for their work. Their work is like their religion. Whether it’d be a 9 to 5 grind, an internship with no time for themselves, or even a casual job where they basically live at work. Now like most of these it can go in one of two directions.The most common being that they’re not enjoying it, they live for the weekend, Wednesday is hump day, they won’t leave because they see no escape and they do not enjoy their job. There are the rare cases where people work the whole time, they go beyond the call of duty, sometimes on weekends they even do extra work, they love their job and their bosses love them. Out of the two that’s the better one yet they’re missing a lot of life experiences. They might work all year for those 4 week of leave, yet even on holiday work is ruling their life. I’m sure quite a few will fall into this category. It’s a person who has a skilled job that they do well. From cafe, to bar staff, to a repetitive job, or even something in their field of education. They don’t mind or hate their job, but live for something more. Whether it be a hobby they’re funding, constant travel, personal possessions or simply ‘the American dream’. I have a friend that got a ‘9 to 5’ from their degree. They don’t mind it, it’s something they can do and it pays well. Every Friday they finish at 1, go on a 3 day camping trip somewhere in their van, and come back Monday. Each time they save up to do a larger trip. Often these people feel like they’re stuck or don’t know what to do, sometimes asking questions like “how do you find your passion?”, stating “I don’t know what to do” or “I’m still figuring out”. These are people who have truly followed their passion, whether they were getting paid or not. A professional surfer, athlete, musician, or even gamer. They don’t always say “I want to become that”. They merely do it, and persistence and passion take them there. Yet it’s not always that simple. I have a huge passion for skating, coding, even some forms of music. Yet I mainly skate to get to places, code just some of my ideas – not pushing myself -, and I have the musical ability of a fish. These people could even be working to just live their passion but ultimately will have such endurance and dedication they’ll become an elite. This doesn’t limit you to be passionate about jobs, sports, or hobbies. They can be passionate about changing the world, helping people, or even travel (a lot of you would say I’m passionate about travel, yet there are people who really are and are getting paid by any means to accomplish it, even if it’s street performing). If you’re trying to find your passion, you should stop and just let it happen. It will often take over naturally. The hardest to define of the four, yet if this is you, you’ll know. This person is not just doing something they’re passionate about, they’re doing it for a reason. They have a plan or a goal they want to achieve. It could be to create a new education system, change the world, invent something to affect/help/change humanity, become the president, or even help their friends and family. Steve Jobs and Bill Gates didn’t just want to create a tech company, they asked “how can we change the world?”. Elon Musk didn’t start SpaceX simply because he loved rockets, he wants a better future for humanity. If you’re doing something you love to do and have a strong reason as for why, you’ll automatically have the passion and persistence to make it a reality. Which are you? By now you would’ve had a good think as to how you fall among these categories. There is no correct one to be in. Everyone’s different and has their own view of life. You can be successful in any one of them. The success is the journey you’re taking. It’s much harder to feel good about yourself if 70% of the time you’re looking forward to the other 30%. Some people believe possessions or certain level of income will grant you success. These are the people that are often chasing the carrot. Just make sure you’re happy where you are. A quick check is if you wake up most days with a smile, you’re on a pretty good path. The four main ways to live life. Dictionary defines success as an achievement of an aim or goal. Yet it’s more about the journey. Check this quick TED talk for a clearer understanding. Or for some tips to help you with your life. This entry was posted in Amateur Pioneers Logic and tagged are, live, passion, purpose, what, work, YOU.